This work spans multiple levels of analysis and thus multiple disciplines, offering an essential overview of the current state of research in the field. 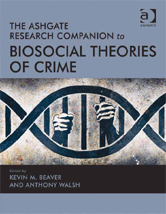 The authors are experts in a variety of disciplines (sociology, psychology, biology, criminal justice, and neuroscience), but they all have in common a strong interest in criminal behaviour. This unique book will be essential and accessible reading for all students and scholars in the field.